NEW ORLEANS – A well-rounded team excels both in the classroom and on the course. That’s exactly what the New Mexico women and Portland men did in the fall. That’s also why the Lady Lobos and the Pilots were named the NCAA Division I Scholar Teams of the Year for the 2017 cross country season. New Mexico and Portland earned this honor by being the top finishing team from their gender with a cumulative GPA of at least 3.0 on a 4.0 scale. The Lady Lobos captured the women’s team title, while the Pilots placed runner-up to Northern Arizona (who didn’t qualify for this award). 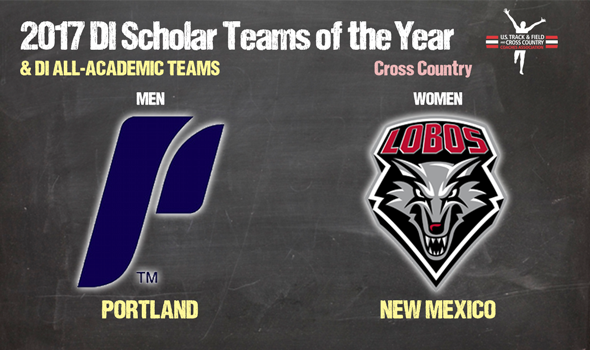 This is the second time in the past three years that New Mexico won the Women’s Scholar Team of the Year Award. The Lady Lobos also won in 2015 after crushing the field at NCAAs. New Mexico wasn’t going to be denied in 2017, either, as it put four runners in the top-15 led by Scholar Athlete of the Year Ednah Kurgat’s individual win. Kurgat led the Lady Lobos to a team score of 90, which outdistanced runner-up San Francisco by 15. Many thought Portland came out of nowhere to finish runner-up to Northern Arizona, but those same people must not have seen the Pilots steamroll the field at the NCAA West Regional one week before. Portland then went to Louisville, Kentucky and saw three of its runners be named All-American and its entire scoring lineup finish in the top-55. Overall, there were 423 teams that brought home All-Academic honors. Of those 423 teams, 228 of them were women’s programs and 195 of them men’s. UC Davis had the top men’s and women’s GPA. The Aggie women led all programs with a 3.85 GPA, while the men weren’t too far behind with a GPA of 3.8. See below for a full list of teams honored by the USTFCCCA.